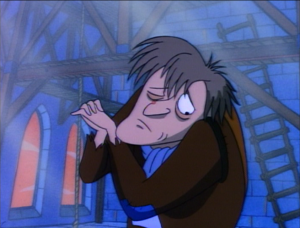 Since Today is the Feast of Fools/The Epiphany which is the day the Hunchback starts on, I thought I would take a break from Silly Sunday and review one most outstanding and most beautiful versions of Hunchback. Unfortunately this version is the shortest and it really is just a reference in a TV show but the shear masterpiece of this makes it more than a mere reference it’s a classic version on to it’s self. 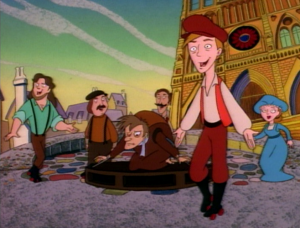 This version centers more around Quasimodo and the citizens of Paris. 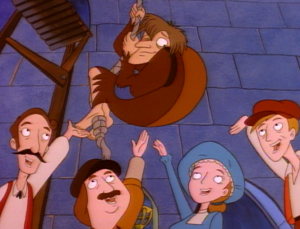 It opens with Quasimodo tied to the pillory and the citizens blaming all their problems on Quasimodo. 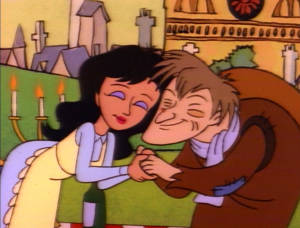 But Quasimodo takes it in stride and meets the lovely, innocent and kind Esmeralda. Quasimodo and her meet for a romantic picnic where they fall in love. 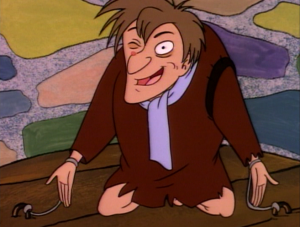 However a misunderstanding occurs and Quasimodo is let alone in his stone deaf world. The silence is broken by the toll from the bells. 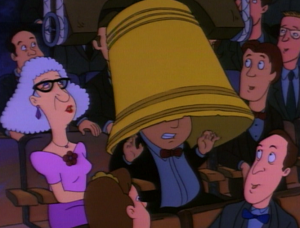 A bell in then lower into the audience where one lucky person is blessed to be the bell’s clapper. It is in this moment that Quasimodo gets the courage to save day and wins the respect and acceptance of the people of Paris. This musical has lot of memorable numbers and brilliant lyrics. 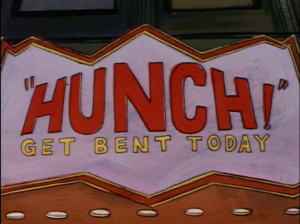 It also make full use of all the wonderful word-play and sight gags that can be done with the word “Hunch.” It’s quite apparent that Disney saw this fantastic and was like “let’s copy this” but Disney fails to capture the power, the magic and the overall spectacle of this timeless version. Even the beloved Notre Dame de Paris pales in comparison the the majesty of Hunch. Clearly Hunch is the most amazing and genius rendering on Victor Hugo’s novel ever made and it’s worthy everyone love and adoration. LOL! 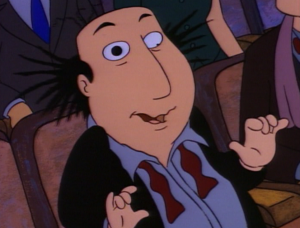 I remember this show from when I was a kid and how it had so many HOND references in it. Unfortunately I didn’t get to celebrate on the 6th…stupid work gets in the way of everything! But I’ll be celebrating tomorrow! Gotta love days off.